I wanted to let all of you know that my brother Daniel is home from Afghanistan! Hopefully he won't have to go back for at least another year. I normally try to keep my blog all about stamping, but since so many of you sent cards to my brother I thought it was only appropriate that I let you know he's back in the U.S. I've had the same photo of myself on my blog for over a year, but I thought I'd show you what that photo looks like uncropped. It's actually a picture of Daniel and I taken at a family reunion last summer. Here's another picture of my brother when he was in Afghanistan. I'm so grateful that he's home safe and sound. Thank you so much to all of you who sent him cards, packages, and prayed for his safe return. It means so much to me. Daniel got the birthday package I sent him and he says to tell you thank you for all of the cards. He wasn't able to let me know sooner that he received the package because he was so busy working. I only heard from him 2 times during the whole 8-9 months he was gone. Recently I participated in the Control Freak's Holiday Mini catalog swap. As always, the swap cards were amazing! I feel so honored to be part of such a great group of stampers. The stamp set I chose to use for the swap is "Love Owl-ways." The inpsiration for this card came from a sketch challenge on SUDSOL. Originally this sketch was designed for a scrapbook page, but I adapted it into a card layout. 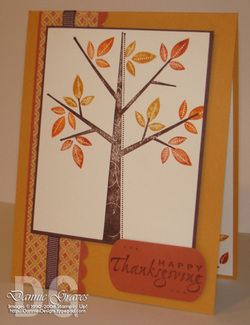 I stuck with the layout and even stamped the horizontal layer with polka dots. I stamped the little birds in Basic Gray and colored them in with markers. They looked like they were floating in space, so I took my Bashful Blue marker and drew a couple of lines under each bird to give them a shadow. It helped ground them a little better. I punched scallops down the left edge of the Real Red cardstock and pierced holes in each scallop. I also used my paper piercer to pierce the holes for the three silver brads. I've been stamping a lot lately with Fall colors, so the red and pink were a nice change. Even though I made this card a couple of weeks ago, it goes nicely with the color challenge Kirstina issued last week--reds and pinks! At my monthly downline meetings we take turns providing make-n-takes for the meeting. Mary took a turn this month and had us make this cute mini pizza box. She copied the design of the box from Beate. Isn't that cute? 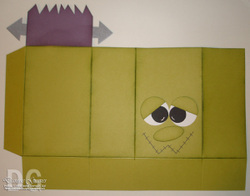 You can download a copy of the pattern for the box here. Here's a better look at the top of the box. Here's what the box looks like open. This past Thursday was my monthly downline meeting. I love being able to visit with the other demonstrators in my group as we swap cards and make projects. Here's the swap card I made for the meeting. The base of my card is 5 1/4" square. For some reason I don't often think of using Whisper White cardstock for layering. I tend to think of it more for stamping on as the main focal image. I'm not sure why that is, but I think it works great as two of the layers in this card. In the center of the card, the Night of Navy cardstock is 3 1/2" square, the Whisper White is 3 3/8" square, and the Baja Breeze is 3 1/4" square. It's difficult to see in the photo, but I stamped the small snowflake stamp from Season of Friendship stamp set in Baja Breeze ink on the Baja Breeze cardstock. I added lots of paper piercing around all four edges of the Ski Slope designer series paper as well as around the Baja Breeze cardstock under the snowflake. I also pierced the six holes for the Silver Brads using my Paper Piercing Template. 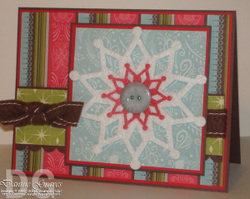 The snowflake was cut from Shimmery White cardstock using the Snowflake #2 die for the Big Shot. I placed the snowflake on top of the three layers of cardstock under it and pierced a hole in the center of the snowflake that went through the three layers of cardstock as well. I put a clear Rhinestone Brad from the Pretties Kit through the hole and that's how the snowflake is attached to the card. Because I didn't use any adhesive, the snowflake can rotate around in circles. This past week I got a sweet surprise in the mail. Donna Keller-Houser sent me some Bella Rose designer series paper that she had cut using her Baskets and Blooms Big Shot die. She said she hadn't seen me post one of these baskets on my blog so she thought she'd send me some die cuts to play with. Isn't that sweet? It's very observant of her too. Thank you Donna! So I sat down and made this darling basket. Here are some quick tips on how I put it together. 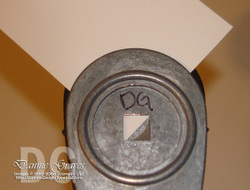 Put a piece of Sticky Strip on each half of the basket in the little section marked off by the perforated line. Adhere the two sections of the basket together. DO NOT fold the basket on the perforated lines. If you do this, your basket will be more oval shaped than circular. Put a piece of sticky strip across the inside bottom edge of the basket. The Sticky Strip will have little buckles and bumps in it because it's a straight line and you're trying to put it along a curved edge. NOTE: If you click to enlarge the photo above, you'll see that the perforated section is going down the left side of my basket. This is important to note for the next step. Take the bottom of your basket and fold along the score line so that all of the little tabs are pointing down. You can see the red tabs in the photo below are pointing down. Now it's time to adhere the bottom of the basket. You want to start adhering the bottom of the basket on whichever side your perforated strip is on. My strip was going down the left side of my basket, so I started on the left side. Line up the bottom of the tabs with the bottom of the basket and roll it slowly across the length of the basket. This will adhere each of the tabs as you go. When you've rolled across the entire length of the bottom edge, adhere the two sides together to finish forming your basket. Here's what the bottom of the basket looks like when you're done. I wanted to put some candy inside my Frankie box that I made in my last post, so I played with some Peppermint Patties and came up with these. Normally I cover the peppermint patties with my Scalloped Circle punch, however I wanted to see what I could make with my other punches. 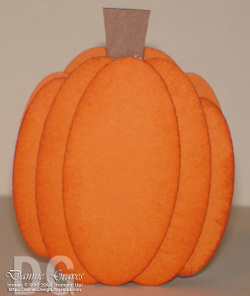 I used three large oval punches and two small oval punches to make this pumpkin. I sponged Pumpkin Pie ink around all of the ovals before I assembled them together. I punched out another set of ovals to cover the back of the Peppermint Pattie too. I used a scrap piece of Close to Cocoa cardstock to make the stem. and then punched them to get the rounded top. 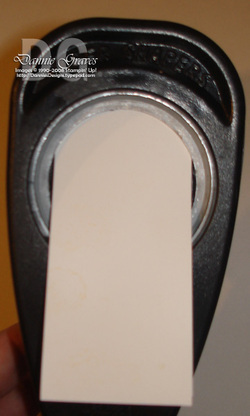 For the bottom of the ghost I used the 1/4" Square punch and punched along the bottom like this. 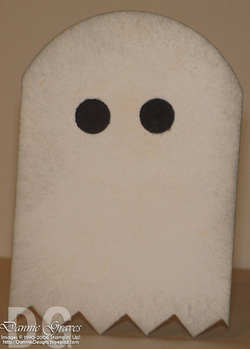 I finished the ghost by adding two 1/4" Basic Black circles for eyes and sponging Going Gray ink around the edges. 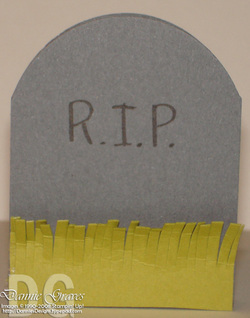 I made the curved portion of my tombstone the same way I did for the ghost. I took a marker and wrote "RIP" on the tombstone. I finished it by adding some grass (cut Kiwi Kiss cardstock) to the bottom. I think Frankie is my favorite. His face is 1 5/8" x 2 1/4". The whites of his eyes and eyelids are made using the 1/2" circle punch and the black of his eyes and his nose are the 1/4" circle punch. I added the tiniest arrow from the My Way punch for the bolts in his head. I also put a tiny piece of dimensional behind each eyelid and his nose. 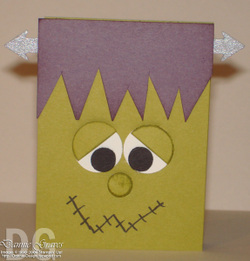 While I was swapping at convention I got the cutest Frankenstein card by Kathy Alt. Of course now that I'm talking about it, I can't find it to take a picture. Then again if you could see my stamp room you'd understand why I can't find it. It's a disaster because I've been going through all of my stamp sets and pulling out the retired stamp sets that are for sale. 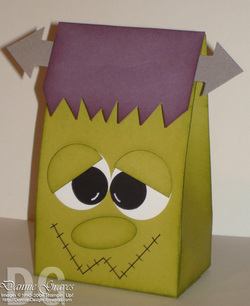 I used Kathy's card as inspiration and decided to make a 2-5-7-10 Frankie box. Didn't he turn out cute? I love it! 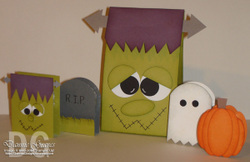 I started with an 8 1/2" x 11" piece of Kiwi Kiss cardstock and used this tutorial on Splitcoast to make the box. I punched out two large arrows from Brushed Silver cardstock with the My Way punch. I adhered those to either side of the box lid flap. Next I glued a 2" x 3" piece of Perfect Plum cardstock on top. I took a pair of scissors and cut out his hair. It's difficult to see in the photo, but I also sponged Perfect Plum ink around all of the edges of the Perfect Plum cardstock. Here's what the box looked like before I assembled it together. I drew the mouth on the cardstock with my Basic Black marker. The whites of the eyes and the eyelids were made with the 1 1/4" circle punch. The blacks of his eyes were made with the 3/4" circle punch. His nose is the small oval punch. I sponged Old Olive ink around the edges of his eyelids, nose, and on all of the edges of the box. The nose and eyelids are attached with dimensionals to help them stand out. I used my white gel pen to draw some highlights on the black part of his eyes. I used Velcro dots to hold the lid closed. I have added over 75 stamp sets to my "for sale" page along with several wheels, brass stencils, and other accessories. You can view the complete list here. 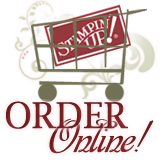 Please remember that I can only sell these items to people living in the US as per Stampin' Up! 's policy. I've been making different Halloween and Christmas projects lately, so today I challenged myself to make a Thanksgiving card. I used the Season of Friendship stamp set that's in the Holiday Mini Catalog. I love that this stamp set can be used for different seasons throughout the year. Fall is my favorite time of year and I love looking at all of the different colored leaves on the trees. I used Juntos designer series paper which is exclusive to the Spanish catalog "Celebrando Creatividad." The colors in the DSP are More Mustard, Really Rust, Always Artichoke, and Mellow Moss. These colors are perfect for fall. For the sentiment I used my Key Tag punch. I had my paper piercer out to pierce holes in the scallops so I pierced a couple of holes here too. I'm telling you--it's addicting! I hope you had a wonderful weekend. We took our children to the pumpkin patch and let them pick out pumpkins to carve. They had so much fun running up and down the rows of pumpkins trying to pick one that they liked. I also picked up a few of the Sugar Pie pumpkins so I can bake more pumpkin pies with them. Yum! Many of you also left wonderful holiday recipes that call for pumpkin so I'll be using some of it on those as well. I hopped on my computer this morning to find some inspiration for a card. As soon as I saw Julee's Mojo Monday sketch, I knew I had to give it a try. As you can see by looking at the sketch, I'm missing the white layer. I tried to add a layer to my card, but I just couldn't get it to work so I left it off. Sorry Julee! I wanted to use my new Felt Flurries snowflakes and this was the perfect sketch for them. The center of each of the snowflakes is hollow, so I put a Pop-up Glue Dot on the designer series paper in the center of the large white snowflake. Then I layered the red snowflake and the button on top. I pushed down on the button to make sure the back of it stuck to the Pop-up Glue Dot and that's how they're adhered to the card. The glue dots are so sticky that the snowflakes and button aren't going anywhere. I also used two more new products from the Holiday Mini Catalog--Ski Slope designer series paper and Alpine Ribbon Originals. I love how all of these products coordinate with each other so well.